I’m on a roll this month. This is the second layout I have done that isn’t about my daughter! I’ve been dying to do a layout like this since my very first Design Team box arrived. 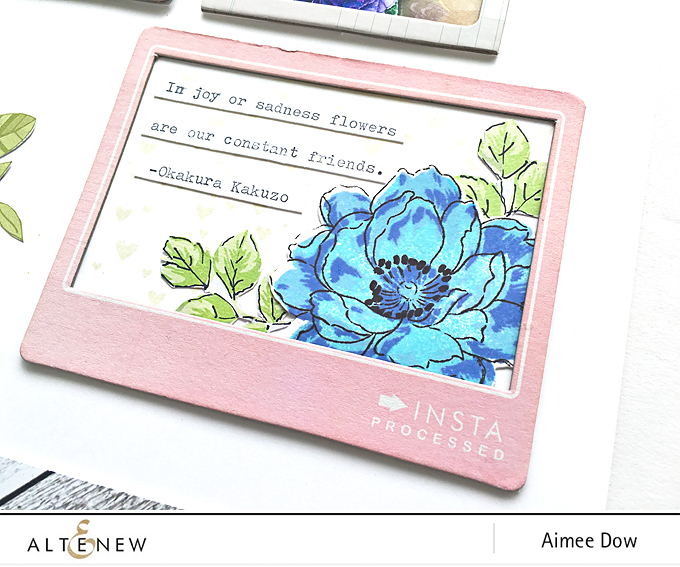 Altenew makes THE BEST flower stamps. So when I came across the quote “In joy and sadness flowers are our constant friends”, I knew it was the perfect opportunity to justify my fresh flower addiction and a layout. 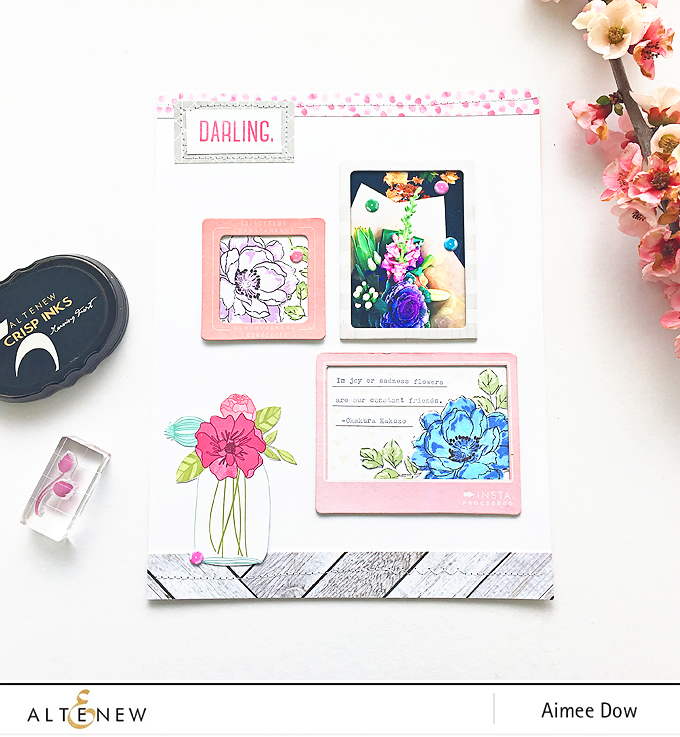 I used a ton of Altenew Stamps in this Layout – I used the Beautiful Day Stamp Set for the flowers, but choose to use leaf stamps from the Vintage Rose Stamp Set, as they were slightly smaller. I also created a background in the larger frame using the Tiny Hearts Stamp Set. I think without a doubt this Peony stamp is my favourite. 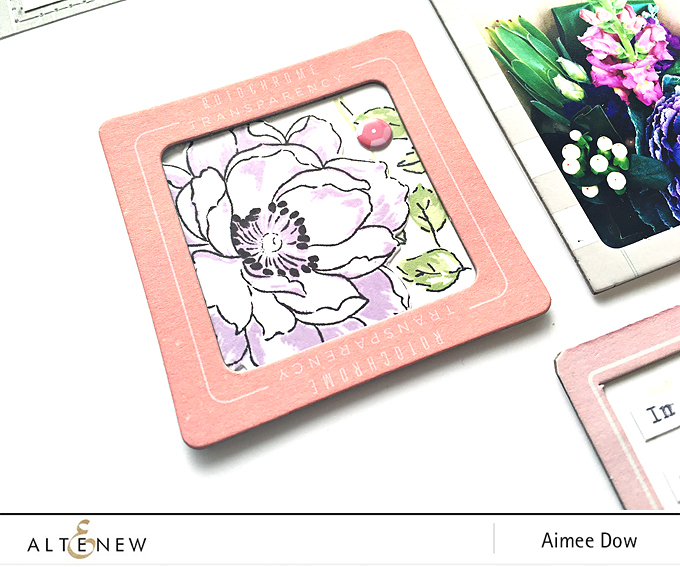 I used the Arctic, Soft Lilac, Lavender Fields and Jet Black ink pads to create the purple Peony. The leaves were stamped in Frayed Leaf and Forest Glades. I also did my own little outline with a fine liner so as to match the flower. The blue Peony was made with Ocean Waves, Dust, Caribbean Sky and Jet Black. I followed the same process for the leaves in this frame as above and because I am indeed the worlds worst fussy cutter – I used the Beautiful Day Die Set and the Vintage Roses Die Set to cut out my handy work before layering them behind the Crate Frames. I used a pencil to trace the inside of the frame on to my Solar White Cardstock before stamping it with the Tiny Hearts Stamp in Morning Frost. 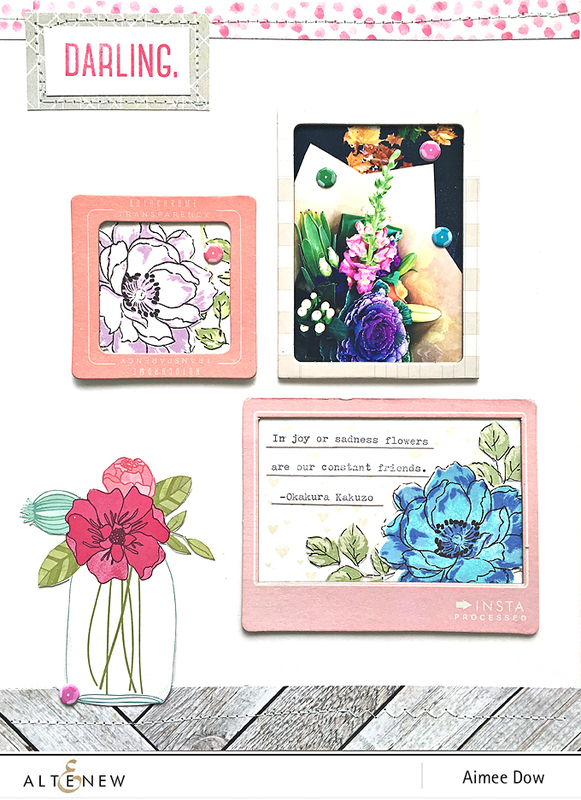 Hostly if the Peony from the Beautiful Day Stamp Set is my favourite stamp. Then Morning Frost would have to be my favourite Ink color. I typed my quote out on a scrap of Solar White I used to stamp and die cut my flowers. Then glued it in taking care not to cover up all my pretty hearts. The rest my friends is easy. All the papers came from my off cuts bin. Even the little mason jar was on an off cut from a Dear Lizzy line a few years ago. I love how it balances out the strong purple flower in the photo and the bright blue Peony. I stitched the top and the bottom strips down and scattered some puffy sticker sequins. That’s it. Couldn’t be any easier. I’ll be back on the weekend with another layout. Not going to lie – it’s probably going to be baby related. I love the Beautiful Day set. Your layout is really beautiful. Thanks for sharing.